Welcome all to my weekly Needlework Tuesday post. I have a special treat for you. A Gallery of Afghans. My regular readers know that I have been working on a special project for the past three weeks, I am now on ball 10 of 12. Getting close. If you missed those posts, click here to see a photo. Other wise, sit back and enjoy the show. I'll give as much details about each as I recall, but some of these have been in the house for decades or were gifts. These are in no particular order. Snowflakes - made for my niece from New Zealand so that she can enjoy snow any time of the year. From a pattern from Red Heart. If you choose to make it, remember that it really needs 7 balls of variegated, not the 5 stated in the pattern. I loved this pattern so much, I had to make one for myself. I knit this one for my friend in New Zealand. Because their climate is so moderate all year long, most people don't have central heating, they rely on a fireplace or space heaters. A cuddly warm blankie was very appreciated by her. From a free pattern from Bernat using Mosaic yarn. I needed two additional balls to get stitch the correct number of motifs. This pink beauty belongs to daughter. By the time I got to the outer rounds I had the stitches on three round needles. I believe there were over a thousand stitches. It is made from at least a dozen worsted weight and specialty yarns. Sorry, I don't recall the pattern. 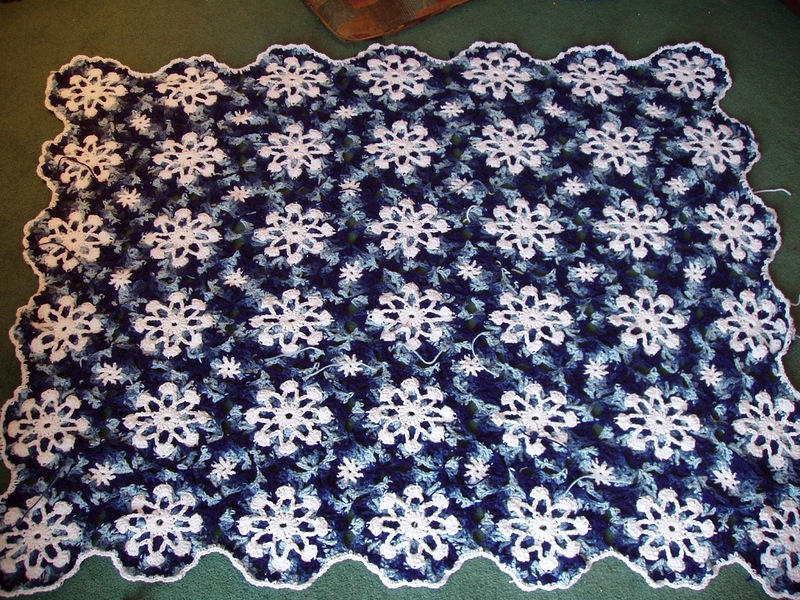 This is the first and only afghan i have made in the style where you have to sew blocks together. It wasn't as bad as I imagined it would be. Pattern was a free Bernat knit along. 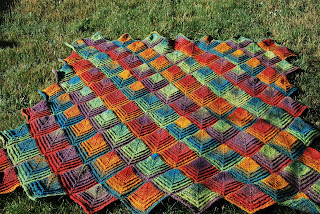 Satin Mystery Afghan Knit Along. Since son selected the colours, he got the blankie. Years ago I bought some patterns books from Annie's Attic. 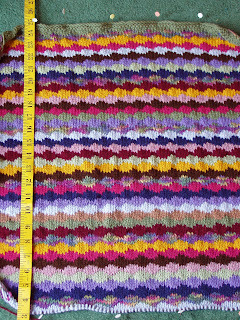 This is one of her Mile A Minute afghans. I ran out of yarn stitching the rows together and knew I'd never match the colour, so used some aran that was sitting around. My dog's blanket. I was hooked using two strands of worsted weight. i used a large oval loom. Best part of the project is that the whole family along with visitors all worked on it. it is very stretched out as it was washed several times at the vet offices when the dog stayed there. Now that we no longer have the dog with us, we haven't been able to let go of the blanket. 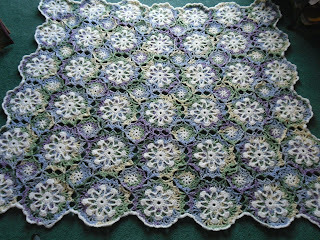 I had bought a kit to made a granny style blanket. I tried several times to stitch the motif, but couldn't get it to work. I found this wave pattern somewhere and worked until I ran out of yarn. I really love the scalloped edging that finished it off. This is the first afghan that I knit. I did it during university from a kit I bought from Mary Maxim. It's a pale pink and is a fluffy yarn. This one lives in son's room. He was supposed to take it to school with him, but he insists that my sister, where he lives, has plenty of blankets. 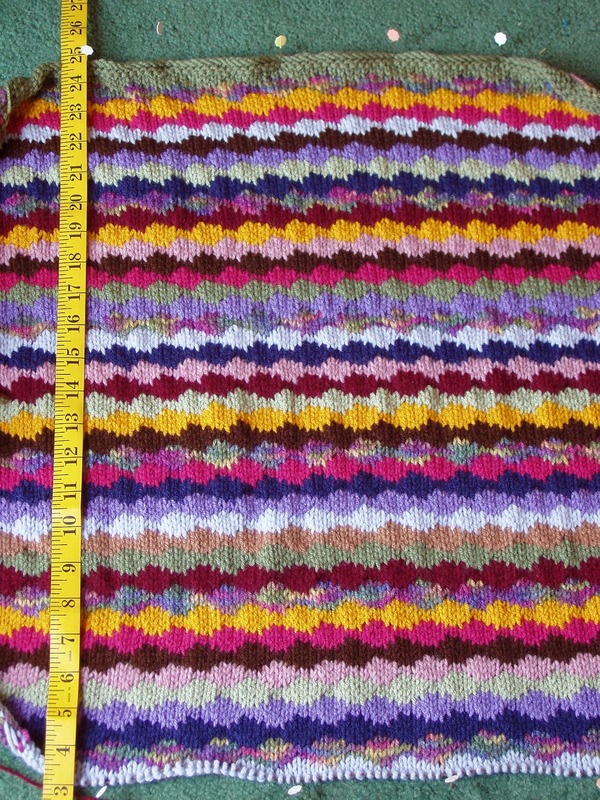 It was knit in diagonal strips and then sewn together. I think it was a pattern on the ball band. Possibly from Bernat. This was an early adventure in crochet. It involved lots of ripping out, head scratching, and I'm sure more than a few curse words. I didn't have any one to ask what terms meant, and the Internet was still something in the future. I was for my son as a wee baby. It was from a pattern book from Annie's Attic. There were two books, six patterns in each so you could crochet a years worth of baby blankets. This was from the same book. it is supposed to be rectangular, but it more similar to a loop sided diamond. This one belongs to daughter. I had this light weight worsted yarn sitting around for years. I really like that it has a bit of a sparkle to it, b didn't want to make a sweater. In the end, i decided to knit for my first grand daughter. That is still years in the future, so I guess I have time to stitch the ends in and try and gently block it. This next section are afghans stitched by others. My mother made this multi colour worsted weight blankie for daughter. 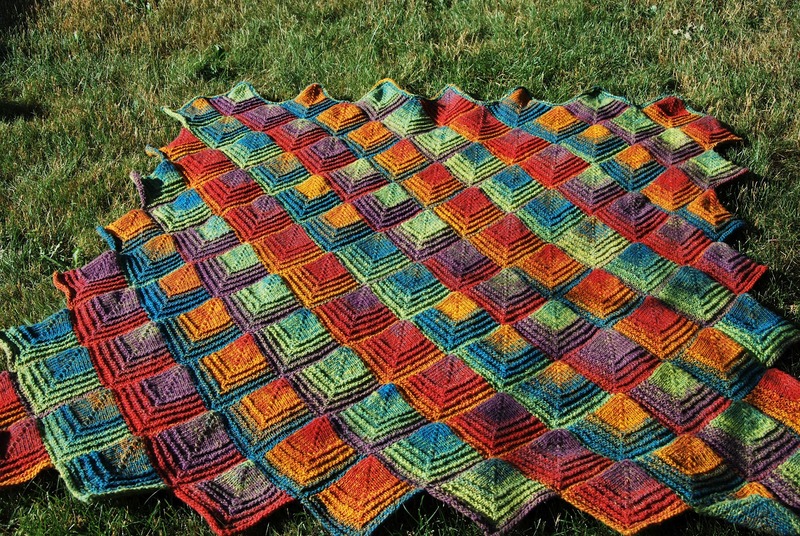 This beauty is the one that started my love of knit and crocheted blankies. When I was in high school my mother had been working on this for age. I told her many times how much I loved the colours. When I was packing to leave for university, i found it strewn across the top of my bed one day. it travelled to university with me and now it lives in my son's room. And yes, I still love it. My mom made this for daughter. It is a Mile a Minute style, though I don't know the pattern source. My husband's Aunt Jean made this for my son. 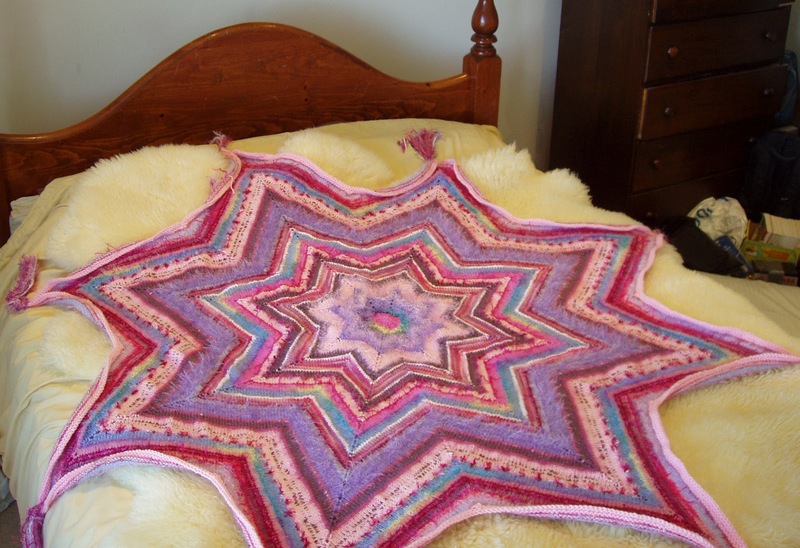 At that point she was making a version of this blanket for each of her grandchildren. Each motif is different. My son was fascinated by all the colours. It sits safely folded in his closet until he has a home of his own. I found this in my son's room, in the same closet with the one above. i had forgotten about it. I think that my mom's sister in law, Jan, made this for my son. Son is almost 19, so it's okay that I am forgetting a few details from his babyhood. My mom started making this for my daughter almost as soon as I told her I was expecting. I still love the peach and green colours. This one is hubby's only afghan. His grandmother showed him a Mary Maxim catalogue when he was a pre-teen and she asked him which afghan he liked. This is the results. We received it from her as an engagement gift. Daughter has claimed it and it resides on her bed. It is so thick and warm. The following afghan was stitched by my online friend Sherrie, from Just Books. 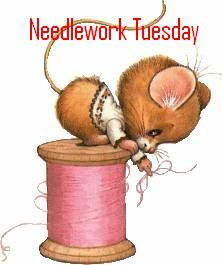 She joins me every so often with a Needlework Tuesday Post and was the one who made me my little thread mouse that I use at the top of the post every week. Finally, the one I have been putting off working on. I really like it, but it takes so long to stitch a row. it uses slipped stitches and it take 6 rows of knitting to advance 4 rows. It is for hubby and will be the thickest afghan once completed. perhaps I'll get back to it this winter. Maybe if I add in a new colour it will inspire me to stitch away? Thank-you for joining me for my tour of beds and closets and all afghans in between. There is one baby one missing, but I don't know where it is hiding in daughter's room. 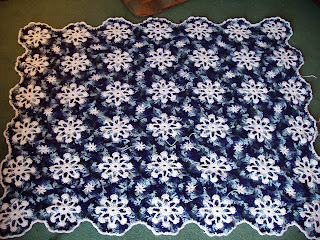 I hope by next week that I'll finished the cable blankie I am working on and will have the final photo for you. Until then, happy stitching. Nice collection! 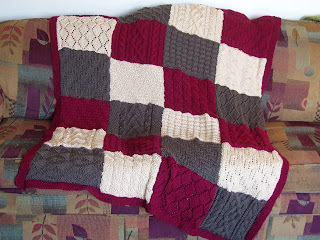 I have a number of afghans I made years ago that are sitting around mostly gathering dust, though, probably not as many as you have. What a great collection of afghans you have. My fav is the snowflake. I love it so much. Do you want shades of Grey?